I'm no "fashionista," but I can hold my own when it comes to pop culture these days. Men's shorts have been getting longer and longer. We are getting dangerously close to the line where the inevitable debate will begin: Are they shorts or are they pants? I'll let you intellectuals in your coffee shops around the world debate that one and just pray quietly that it doesn't lead to a war. 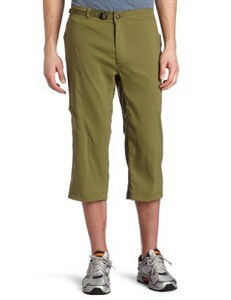 In the meantime, I will relate this fashion trend to the history of golf. Knickers, short for Knickerbockers, were the popular choice of golfers in the early twentieth century. "Plus fours" were a common term, meaning the trousers extended 4 inches below the knee. Additionally, there were "Plus twos," "Plus sixes," and "Plus eights." Payne Stewart, the popular PGA touring pro that died in a plane crash in 1999, always sported this throwback or "old school" style. These Prana Nemisis Knickers are a lot more updated then the pants he used to wear. They look very current, even if you were not golfing and just relaxing at the aforementioned coffee shop. Although these knickers are designed especially for climbing, I like the fabric for golfing because it is weather resistant and stretchable nylon for free range of movement. Another good pair is the Ferrosi Knickers. For a more traditional-looking knicker, you can try the Civia Wool Knickers. And if you want something that looks a little more old-fashioned, you could check out this golf knickers costume, but it's more of a gimmick or Halloween costume.